". . . Balancing the scales is a task left to the Bohuslav Martinu Philharmonic and its conductor, Peter Tiboris; the Pro Arte Chorale; and the performance of tenor Joseph Wolverton in the title role. The orchestra, founded in Czechoslovakia in 1946, frequently performs late-nineteenth-and twentieth-century works in the major European music capitals. Under the baton of Wisconsin-born Tiboris (who made his conducting debut with the American Symphony Orchestra at Lincoln Center in the 1985-86 season), the Martinu Philharmonic does full justice to the music of Silvano. "The same may be said for the Pro Arte Chorale, which is given ample opportunity in each of the opera's two acts.the Pro Arte Chorale, under the direction of Bart Folse, ably performs the choral sections. It falls to Wolverton to bring the title character to life.A lyric tenor who draws his influence from the early recordings of Jussi Björling, Jan Peerce, and especially the young Richard Tucker, Wolverton has a sparkling voice, an adequate range, and a secure technique. In the one enduring piece of music from the Silvano score, romantic lyricism prevails: Silvano's plaintive aria in act 2, "S'è spento il sol," a long narrative with orchestral interludes and a dream sequence (often called the "sogno di Silvano") that in pace and chord structure resembles the Cavalleria intermezzo. Wolverton has no difficulty with the high tessitura passages nor the sustained lines in which the aria's most dramatic moments are expressed. Wolverton sings the middle portion of the narrative in the requisite piano dynamic, at times approximating a Schipa-like tone. The end of the narrative requires a secure upper range, which he also displays. 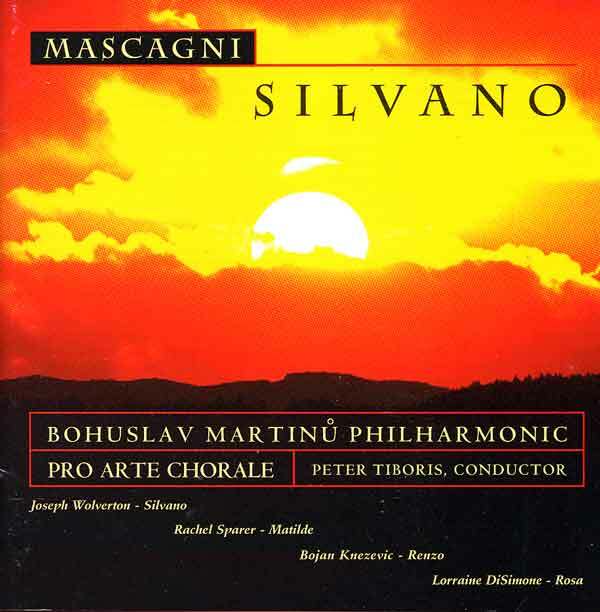 "In the meantime, courtesy of Elysium Records, we have not only a complete new studio performance of Silvano on compact disc but also the promise of other recordings of rare operas yet to come."